Here’s a simple recipe for when you have just a small amount of greens on hand. 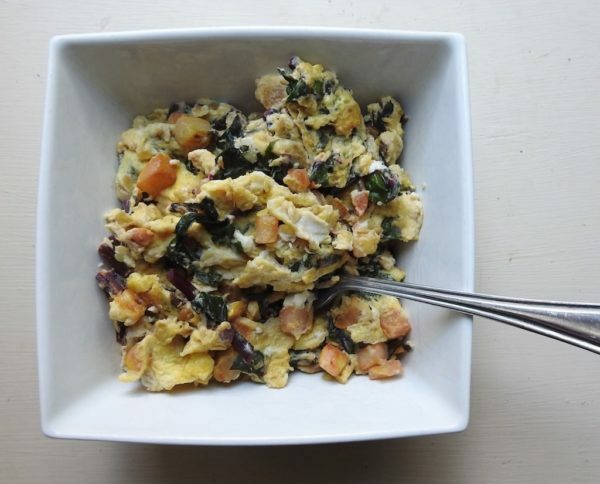 With their dark purple stems, beet greens add a nice bit of color and earthy flavor to this easy scramble. A dash of vinegar and zesty herbs brighten the dish. I used lemon balm—but lemon basil, lemon verbena, or thyme work well, too. This is a great recipe for whatever summer greens you have on hand. Spinach, chard, and dandelion greens works especially well. Tougher greens like kale and collard require a longer cooking time—about 3–5 minutes instead of the minute or so it takes to cook beet greens. Beat eggs, mixing in nutmeg and a little salt. Set aside. Heat nonstick saucepan on stovetop over medium heat. Add olive oil to pan and spread over bottom using silicone spatula or other non-scratching utensil. Toss in summer squash and cook, stirring frequently, until it starts to turn light golden brown, about 2–3 minutes. Add beet greens and cook, stirring, until wilted, about 1–2 minutes. Drizzle with vinegar and sprinkle with a touch of salt and herbs. Stir to distribute evenly. Pour eggs over vegetables, tilting pan to coat evenly. Sprinkle with Swiss cheese. Scramble eggs and veggie mixture with silicone spatula or plastic fork until cooked through.